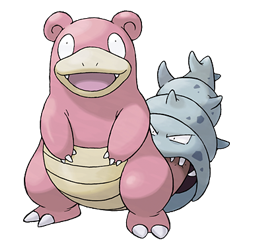 Regardless, Slowbro's got very good stats. Defense is absurdly high, while HP and Special are both nothing to sneeze at. Attack ain't too shabby, either, though Slowbro isn't just a clever name for this beast: as you'd probably guess, it's slow. As hell. But hey, I guess all that extra weight from the parasite on Scarlett Brohanssen's backside reduces the speed.